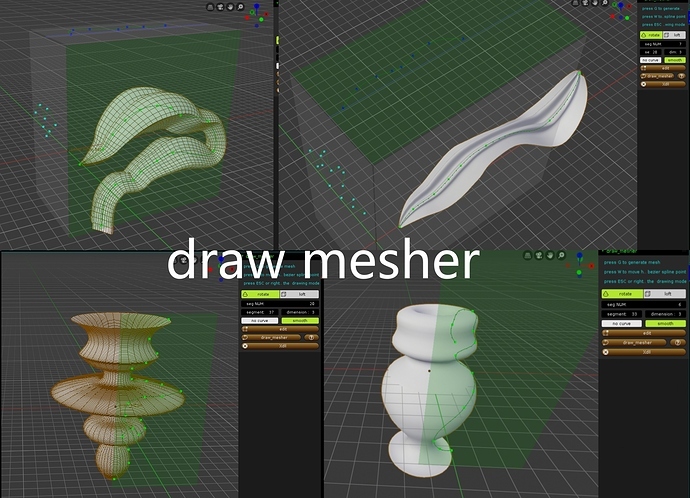 this addon is for blender2.8.which generate mesh directly from your sketching virtual curves (eternal parameterized,written with C++ code). 1: ROTATION: a spin mesh can be created by drawing curves on a plane space. When you have finished the curve drawing, press G to generate the mesh, and you can continue to adjust all the curves after generating the mesh. you can always go back to edit mode, by pressing edit button, because the generated object is eternal parameterized.even you save and close the scene , the next time you open this scene you still can continue the last editing state. the curve point handles are located automatically it’s can be called : auto-curve. Are you going to release also a Linux version? it’s for windows x64 temporary, but I will try to compile a Linux Version in the future, although I have never used Linux before. It’s remind me Polybrush. I don’t know if it’s possible or not… but it would be really good in real time. I can make this brush feature to the addon in the future, it’s not difficult to implement.